Will this year&#8217;s drought be as severe as it was in 2002-03? Will this year’s drought be as severe as it was in 2002-03? This year, the India Meteorological Department says that as on 5 August, the rain deficit across the country has risen to 25%, with the monsoon in the agricultural belt in the north-west being 40% below normal. Now that the rains have failed during most of the crucial sowing season, the odds of avoiding a drought seem increasingly bleak. Will the situation improve before the end of the monsoon? In 2002-03, the Oceanic Niño Index (ONI), a measure of the severity of an El Niño episode, had a value of +1.5 degrees centigrade. This year, based on current readings, the National Oceanic and Atmospheric Administration of the US department of commerce says there’s a likelihood of “at least a moderate strength El Niño" of an ONI of +1 degree centigrade or greater this winter. It also forecasts that El Niño is expected to strengthen and last through the Northern Hemisphere winter of 2009-10. That suggests even the rabi, or winter, crop could be hit. Does this mean the economy, too, will be as bad as in 2002-03? In that year, private final consumption expenditure (PFCE) grew by just 2.9%, down from 6.2% in the previous year. This time, the crisis has already led to a fall in the growth rate of PFCE from 8.5% in 2007-08 to 2.9% in 2008-09. So the most important factor sustaining demand will have to be government expenditure. Government consumption expenditure was higher by 20.2% in 2008-09, as it tried to offset the weakness in private consumption. Economists have already started revising their GDP growth targets downwards. 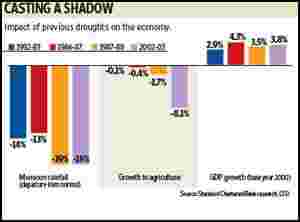 An exception is Morgan Stanley economist Chetan Ahya, who has increased his GDP estimate for 2009-10 in spite of revising his estimate of agricultural growth downwards. He says in a recent report: “We believe that higher-than-expected industrial production and services sector growth will more than offset the downside from agriculture. Consequently, we are lifting our FY2010 GDP growth forecast to 6.4% compared to 6.2% earlier, even as we reduce our agriculture growth estimate to 1.5% from 3%." Trouble is, agricultural growth may not be 1.5% this year. Goldman Sachs’ economist Tushar Poddar expects a 3.3% drop in farm production in his worst case scenario, which translates into a 0.6% negative contribution to GDP. • The share of agriculture, forestry and fishing in 2001-02, the year before the last big drought, was 24%, while in 2008-09 it was 17%. The overall importance of agriculture in GDP is declining. • Growth in government spending will be much more than in 2002-03. • The big fall in agricultural output during 2002-03 was in part the result of the much higher growth in the previous year. This year, the base is low. • Other mitigating factors include high food stocks and ample foreign exchange reserves to import food. But the combined impact of low growth and the need for the government to spend more could lead to more borrowing, adding to the pressure on interest rates. The power situation, too, can deteriorate. Hydroelectric power generation in July was 86% of the generation in the same month last year. And high food inflation will add to costs while hurting demand for a variety of goods. For the markets, the impact of a drought is already being factored in. The return from the MSCI India Index in local currency terms over the past three months, as on 7 August, is 4.6%, compared with 10.1% for EM (emerging markets) Asia. This month, too, MSCI India Index has underperformed. The personal and home care products sector is likely to be the most affected. In 2002-03, while the benchmark Sensex index of the Bombay Stock Exchange fell 12.5%, the BSE FMCG (fast moving consumer goods) index was down 23.5%. The saving grace is that this time the other type of liquidity has been abundant. But then there are plenty of other places the money can go.